Despite the rising popularity of e-books and digital publications, traditional printed books are still not exactly cheap. Buying affordable, second hand books online is therefore a great way for regular readers to save a pile of money. And now thanks to the proliferation of the internet, finding second hand books online is that much easier. Recent years have seen a mushrooming of websites which sell such used books, magazines and publications in good condition at a fraction of their printed cost. And if you happening to be looking for variety, then most of these sites also offer a great selection of second hand books online across a range of genres. This includes text books, entrance exam guides, vocational courses, fiction books, non-fiction, business & economics, self-help and personality development, biographies and children’s books to name a few. So if you’re looking for the best places to buy second hand books online – you have come to the right place. Below is a carefully curated list of 11 best places to get used books online in good condition– to satiate your appetite for reading without burning a hole in your pocket. This US-based website offers a huge collection of new and second hand books online – which includes best sellers from top authors like Jeffrey Archer and Mario Puzo (author of the Godfather series), travel books, textbooks and story books for kids. Looking for a good bargain? Checkout their Bargain Bin section for a super selection of used books online and avail of steep discounts – like 20% off if you buy 4 or more second hand books. And did we mention, they also ship orders to India – for free. Students can save up to 70% of their expenses on books on this site which allows them to rent, buy and sell second hand books online and avail the added convenience of a cash-on-delivery system. Pustakkosh stocks books stocks books on a variety of subjects from children’s books to academic books on – Mathematics, Bio-technology, electrical engineering, mechanical engineering, chemistry and electronics communications among others. In addition to a huge collection of new books and best sellers available here, Amazon also offers a section called – Local Finds – where you can easily buy and/or sell used books online. The books cover a host of genres including; text books and examination books (MBA, medical, civil services, banking, engineering), in addition to books on business & economics, self-help, romance, literature and fiction and crime thrillers. What’s more you will also get a full refund if you’re not satisfied with the books delivered to your doorstep. This popular site sells second hand books online by their weight and not by their printed cost. You get to choose from three primary categories – the premium collection, classic collection and the standard collection. Though not new, the site claims that all books are thoroughly checked for quality and are dispatched in good condition. It also offers free shipping (in Mumbai) for orders above INR 1000 and special discounts on bulk orders. This website allows you to buy, sell and exchange books at fair prices. The featured listings on this site include books on academics (arts, management, school & computer science), magazines (lifestyle, health & fitness, business and humour), tutorials & skill enhancements (certification courseware, dummies guides, entrance exam prep and foreign language guides). For lovers of fiction, it also offers a great collection of novels & best sellers (crime, horror, fantasy) and non-fiction books (biographies, autobiographies, crafts & hobbies, cooking & food). Quikr, the popular online marketplace also has a category for buying and selling old/used books. You get to choose from second hand books which have been – heavily used, gently used and almost like new. The selection includes an assortment of books ranging from used children’s books, academic textbooks and study materials, fiction & non-fiction titles and other varieties of heavily discounted used books, across various price points. 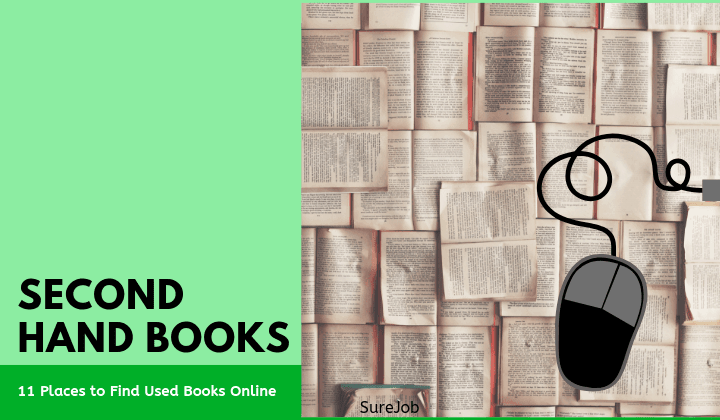 You can also get lucky in your quest to find a particular title or textbook in the second hand books category on this online marketplace. Frequent finds here include used school textbooks, engineering & medical course books and study material for NEET and other competitive examinations, posted by individual sellers. This online bookstore aims to save trees by encouraging the buying of second hand books online at low prices near to your location, school/college or class. Here books are just a click away and are available across multiple categories which include school (NCERT, entrance, science, language, commerce, computer, mathematics), college (bachelor, master degree, Ph.D, BCA, MCA, MBA, B.Sc and M.Sc) and My Place – a section which allows you to search for books closest to your location/campus. If you’re on the lookout for good quality, second hand books at reasonable prices delivered to your doorstep, then this is the place you need to be. It stocks used books across various academic (school, graduate & post-graduate) levels. Some of the other popular options include books on fiction, non-fiction, engineering & management, biographies and autobiographies. Lovers of fiction are eligible for a further 5% discount for buying books INR 499 & above and a 10% discount for deals worth INR 799 and more. You can also buy select books listed in their – Sale at 60 – section for just INR 60 per piece. Second hand books across popular categories including; romance, fiction, travel, photography, short stories, children, biographies and non-fiction are up for sale on this site. All purchases come with a 100% money back guarantee while orders above INR 500 are also eligible for free shipping. As an added incentive this Guruguram-based site also offers additional discounts of between 10-20% on the use of special promo codes (listed onsite) and discount coupons. This online marketplace for books is the perfect place to find millions of rare books, used books and even out-of-print books from across the world – on sale. From books dating back to the 15th century to new and used textbooks for students and rare titles that are sure to excite book collectors – this site has something for everyone. As somebody once put it beautifully – A reader lives a thousand life’s before he dies. The man who never reads, leads only one. It’s also been scientifically proven that reading regularly comes with several health benefits – like relieving stress, improving IQ and keeping degenerative diseases like Alzheimer’s at bay. But above all it’s a great way to stay updated and increase your knowledge on a variety of subjects. So now that we have given you the tools to search for how some great reading material online – without the need to spend a king’s ransom – its time you reignite your passion for books. And be sure to let us know how it went. Happy Reading.